First Look HARBINGER WARS 2 #4 – The Final Battle Commences in August! We called it the biggest, most impactful, most ambitious Valiant event ever attempted – and we meant it! From across the Valiant Universe, the paths of all of the world's most formidable heroes – X-O Manowar, the Harbinger Renegades, Bloodshot, Ninjak, the Secret Weapons, H.A.R.D. Corps, and dozens of newly activated psiots – have finally converged, drawn together by their old ally Livewire's last-ditch effort to protect the powerless. 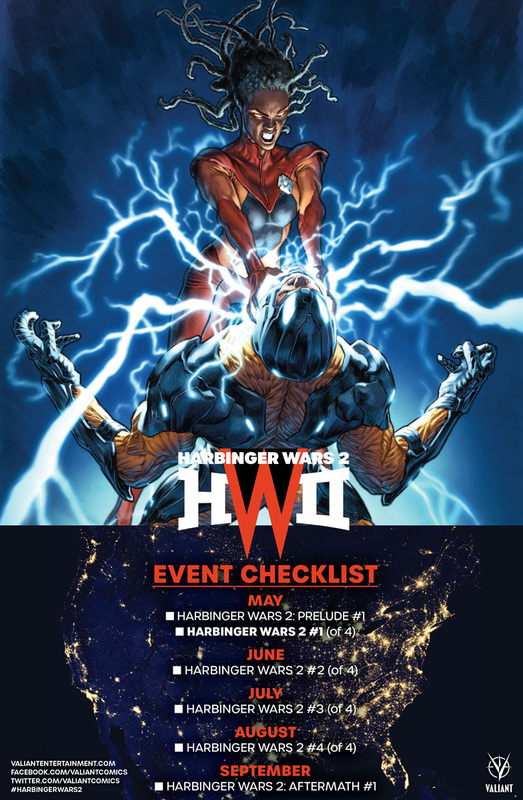 On May 30th, master storytellers Matt Kindt and Tomás Giorello offer up an unprecedented collision of Valiant heroes as X-O Manowar, Livewire, the Harbinger Renegades, Bloodshot, the Secret Weapons, Ninjak, and a cast of thousands draw their battle lines in HARBINGER WARS 2 #1 (of 4) – featuring covers by J.G. Jones(Wanted), Mico Suayan (MOON KNIGHT), Juan José Ryp (NINJA-K), Felipe Massafera (Flashpoint: Abin Sur), and Lewis LaRosa (BLOODSHOT SALVATION)!